If you have a vehicle, drive east on Route 9 to go through the famous Zion-Mt. Carmel Tunnel and enjoy the ride through the wonderous slickrock of the Upper East Canyon. 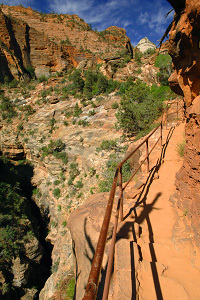 The Canyon Overlook Trail is one of the few official trails in the upper East Canyon; starting just east of the tunnel, it is a nice short-but-sweet hike on a maintained trail that ends at a great viewpoint looking into the main canyon. Along the way, you get some great views down into the Pine Creek slot canyon below, as well as a little break in a cool shaded alcove with lush ferns growing out of the walls. If this is your first trip to Zion, this one is a must-do hike! Caution: while this hike is not very strenuous, there are a few exposed spots where a fall could be dangerous. Rating: Easy short family hike. Elevation Change: mostly level after the initial steps up. Seasons: Year-round, but take caution of any ice or snow in winter. 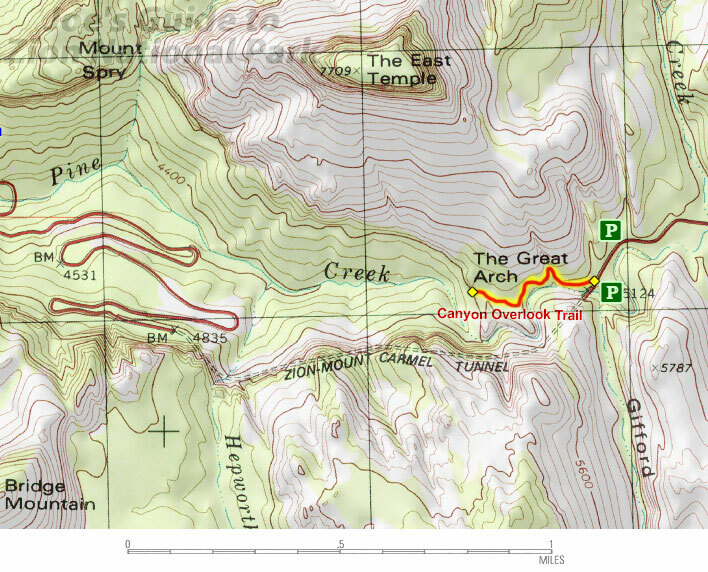 This hike is a short one with a length of less than half a mile and requiring roughly an hour of hiking time. To get to the trailhead, you need a vehicle to drive up Route 9 to the area right by the upper east entrace to the Zion-Mount Carmel Tunnel. The small parking lot on the south side of the road filles up quickly in the busy summer months, but there are several small overflow parking areas further east if you are willing to walk the road back to the trailhead. The trailhead is located behind the ranger traffic booth on the north side of the road. After several steps that take you up the slickrock above the road, the manufactured trail is mostly level, taking hikers around the beautiful sandstone formations above the Pine Creek slot canyon that can be seen below. While railings are in place for many sections of trail, be careful with children and anybody who isn't steady on their feet as there are a few exposed spots where a fall could be dangerous. Halfway to the viewpoint, the trail heads into a wonderful little shaded alcove with a seep and lush ferns growing out of the sandstone walls; this area provides great respite during the hotter summer months. Once at the viewpoint, a plaque points out many prominent landmarks. Some interesting things to look for: the Route 9 switchbacks below, Bridge Mountain (the highest peak on the left side of the canyon), the East Temple (the impressive rock formation above the viewpoint to the right), and the Pine Creek stream far below. Also look closely at the canyon walls to find several of the Zion-Mount-Carmel Tunnel "windows". You can explore around the viewpoint, but be very careful as there cliff edges everywhere; a 1000-ft fall from the viewpoint would be fatal. Relax for as long as you like then return the way you came. This hike is short and sweet with a great viewpoint! 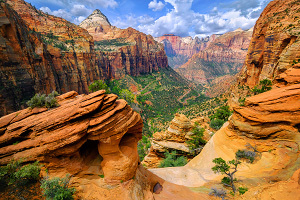 If this is your first visit to Zion, do this hike; you will love the experience! Even after all of the times I have visited Zion, I still enjoy returning to this great little trail.